Final Week for the Kickstarter! We’ve Hit Our Initial Goal! Now Let’s Hit The Stretch! 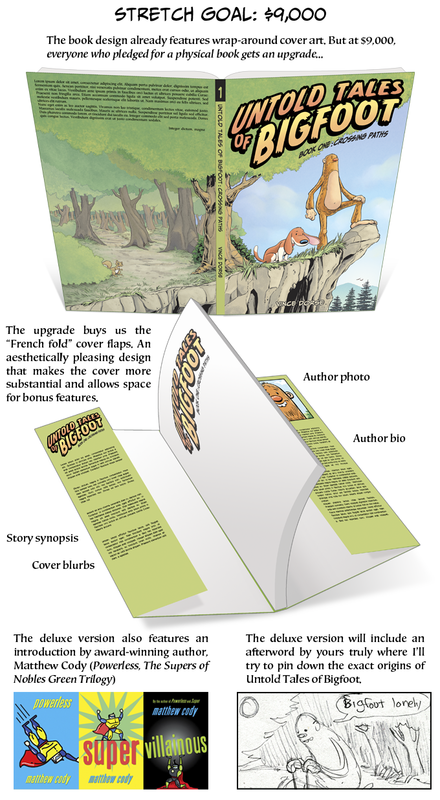 For those who missed it, The Untold Tales of Bigfoot Kickstarter has hit its initial goal! Huge thanks to everyone for supporting and sharing the campaign. Now we have roughly a week left to hit the first stretch goal. If we get to $9,000, everyone who bought a physical book gets upgraded to the Deluxe Edition with the more elaborate ‘french fold’ cover that feels more substantial and allows for a little more content, an introduction by award-winning author Matthew Cody (Supers of Nobles Green Trilogy and more), and an afterword by yours truly where I’ll talk about the origins of Untold Tales of Bigfoot. So keep sharing with your friends, family and followers. That Deluxe Edition is within reach! And hitting $9,000 doesn’t have to be difficult. For instance, we’ve had 15 backers pledge the “Cave Drawings” Reward Tier for $100 so far. Just nine more backers at that tier and we’ve hit our stretch goal. Or 16 more at the $55 “Naturalist” Tier. Plenty of ways we can do it, we’ll just need to reach out to those people who haven’t joined us and let them know about the project. Commissions Can Be Great Gifts! You need one or many links to the kick starter in this update!